One must be relaxed all throughout one's body, except for the areas directly involved with the current movement at hand. No extraneous tenson is allowed - if it is present, it will detract from the efficacy of the movement. One must maintain a good connection with the ground. The idea is to do the technique with the aid of the ground. This obviously requires good balance, as well. One must strive to perform each movement in as exact a manner as possible, mimicking what has been shown down to the smallest detail. Remember to be careful that this includes the correct timing. One must also strive to capture the spirit of the movements. Look closely at the timings, subtle gestures, and facial expressions of your instructor. One must "see" one's opponent, even if it is for a solo form. It is a waste of time to perform the movements without visualizing your opponent - there is no purpose without visualization. One must maintain proper focus at all times. Look at your targets. Make your intent obvious for all to see. 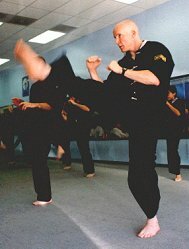 It's not enough to merely walk through the movements - you must practice as if you are actually applying the movements against a real opponent. One must always be aware of one's surroundings. While you are practicing or performing, you must be alert to what is going on around you. You must be ready to adapt at all times, i.e. making sure not to slip, you have enough room, you won't hit the dog that just walked next to you, etc. As you can see, these seven points all build upon one another. They are either extensions of the previous points, they go hand-in-hand with the previous point, or the previous point is required for the current point to work. These are simply the most basic attitudes one must maintain to get the most out of forms work. No doubt each instructor and each style will have many more additions and refinements.